Samantha Haller is no stranger to research. She participated in several projects while a student at Laramie County Community College (LCCC). 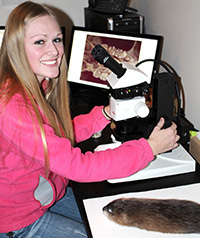 Thanks to a Wyoming INBRE Transition Fellowship, she will continue her research while studying at the University of Wyoming. Haller earned her associate of science degree in biology at LCCC. She is one of nine students from Wyoming’s community colleges who received Wyoming INBRE Transition Fellowships to study and conduct research at UW. Haller, a physiology major, guided by her faculty mentor Guanglong He, an assistant professor in the UW School of Pharmacy, is working on a variety of cardiovascular projects. “I am very thankful to INBRE for presenting me with excellent opportunities both at Laramie County Community College and at UW,” Haller adds. Cheyenne -- Kelsea Zukauckas, Laramie County Community College, and Hannah Jernigan, Sheridan College.